I used to believe that life after college would be fun because I have made many friends in the college. Now, I know that life after college is not as fun as I was in the college. Friends that I knew from college spread out to many different cities, far away. We all were hunting for jobs after college because we earned an adult trophy the same time when we received a degree. We supposed to make a living instead of having fun because the bills were not cheap. Even though, many of my friends are in DFW area, either I or they, could not make a time to hang out. Yes, because we are always busy of either doing something or doing nothing. I started today with practicing yoga at Summit Climbing Gym in the morning. Jessica is capturing pictures of her hot Mocha. Yeah, my finals are coming next week. I went to drop off the wedding package from The Deason's wedding at Avoca Coffee to Daniel. Jessica came to join me studying after ward. She lived only 12 minutes away. We studied for 4 hours before Elizabeth texted me that, "LET'S GO EAT". We all had dinner at Spice, a Thai restaurant. Jessica needed to head back to study. Therefore, I spent the rest of that day catching up with Elizabeth about what we have missed in our friendship. 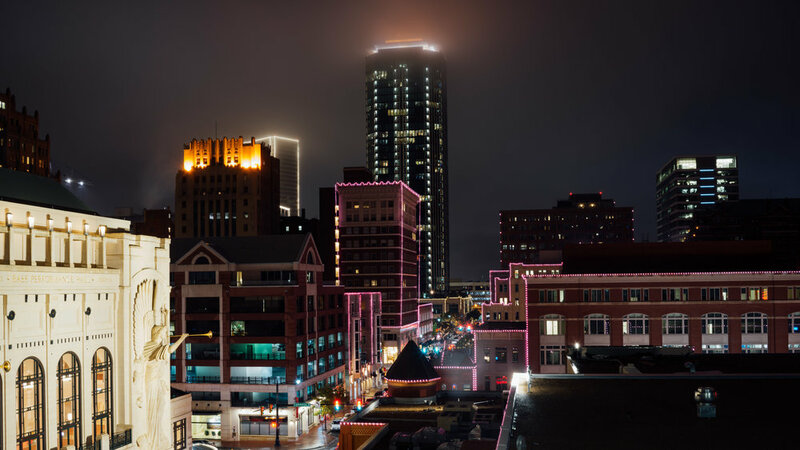 Let's go to Sundance Square! The Christmas tree at Sundance Square was up and beautiful. Elizabeth became a faceless female model for me. I've learned this kind of photography from Stock Photography. I can sell this pictures very easy! Elizabeth and I walked around the square and we talked a lot. I didn't realize that I haven't met her for a very long time even we live only 40 minutes away. And what I have learned about Elizabeth that night is Elizabeth is a very strong woman. It was cold but I had such a good time talking with her. Thank you for coming to see me, Elizabeth. We need to hang out more!